In recent years, the interest and use of small diameter implants have increased considerably. The probable reasons are the clinical credibility in long term use and its minimally invasive placement protocol. Victor Sendax, a conceptualist and developer of small diameter implants, had identified three patients groups in the 1980’s on which the mini implants offered invaluable performances: for medically, financially, and anatomically compromised patients. This paper outlines the clinical experience conducted among 28 patients during a follow-up period of four years. This group is heterogeneous in age, concurrent in systemic conditions and represents the type of a private practice patient whose treatments selected have followed the proposed guidelines for the rational use of small diameter implants. Minimally invasive dentistry is a reality that in the last several years has involved all branches of dentistry. In implantology these minimally invasive techniques have revolutionized the standard treatments and are showing a high possibility of increased practice. Some examples applied in implantology include digital radiology, CT reconstructions, and their evolution with maximum reduction of radiation dose – CBCT Cone Beam to cite an example - and the software for three-dimensional reconstructions (advocated by Ganz already in 1995). The digital dentistry has and is continuing to contribute significantly to the growth and spread of minimally invasive dental treatments. These minimally invasive technologies have also stimulated the development of minimally invasive surgical techniques. Ten years ago, we were not talking about flapless or a sinus lift with crestal approach, whereas today minimally invasive procedures have achieved highly successful performance and predictability and they are used in a dental practice on daily basis . 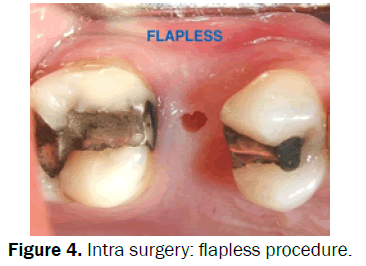 The numerous advantages of the flapless surgery in implantology are well highlighted in the literature and are not just about minimizing surgical trauma but also achieving a fast healing process and good tissue response in the early stages of Osseointegration [2-4]. Strict guidelines are present in the literature about the directions of the flapless technique, and they have been proven to be highly functional in surgeries along with the use of software with the application of surgical guides [5,6]. The flapless procedure was applied with successful results on reduced diameter implants and was not only established to be safe but also decreases gingival healing period when combined with immediate loading . Small diameter implants (SDIs), which were introduced to stabilize temporary dentures, were soon found to have several other clinical applications due to their high versatility [8,9]. For example, they have been used with a success in cases of limited interdental spaces [10,11]. 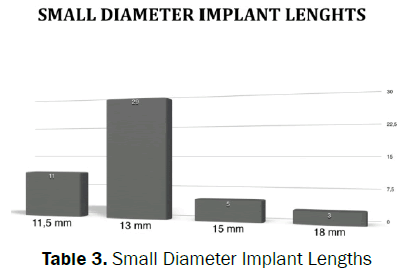 Significant findings have been reported in the literature about the long-term survival of small diameter implants [12,13]. Guidelines are available in the literature about the surgical techniques and rehabilitation, and several evidences suggest fixed restorations with excellent long-term survival data [14,15]. Mini-invasive techniques offer both intraoperative and postoperative advantages, and they facilitate the healing of the tissues . 4. Decreased waiting period until final prosthesis delivery compared to conventional implant treatment. 5. Anatomical limitations are lowered due to smaller diameters of the implants. 6. A less invasive implant treatment option for medically compromised patients. 1. A decreased surface area, therefore a potentially decreased metal fatigue resistance over the long term. 2. Lack of an emergence profile which could make gingival cleaning around the structure more difficult. 3. Since the crowns/bridges will essentially be a pontic design, the esthetic outcome on occasion might be compromised in the anterior areas. 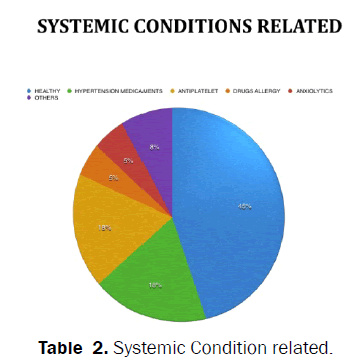 The clinical protocol was applied on a heterogeneous in age, concurrent in systemic conditions and represents the type of private practice patient; the patients were treated from 2010 and 2013. 28 patients were selected: 15 females and 13 males ranging from 23 years to 66 years of age with a median value of 46 years (Table 1). 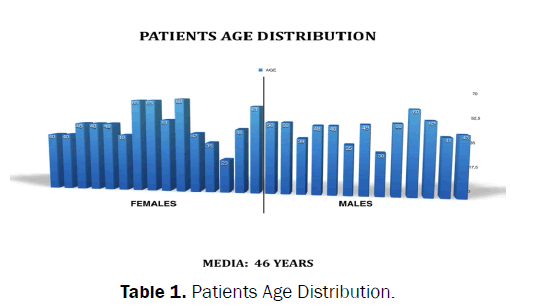 Table 1: Patients Age Distribution. 11 patients were smokers while 11 patients presented rather common systemic conditions such as hypertension and allergies to certain medications (Table 2). Table 2: Systemic Condition related. 48 SDI's diameter 2.5 mm were placed with lengths from 11.5 mm to 18 mm with 13 mm being the most common length (Table 3). Table 3: Small Diameter Implant Lengths. 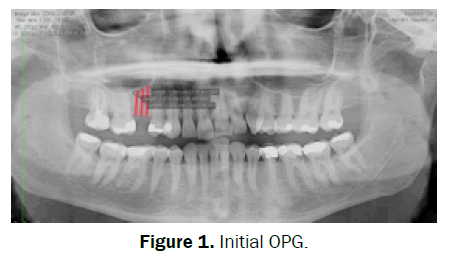 The author has preferred diameter 2.5 mm and wider threads, for the maxillary restoration and the areas with a softer bone as the cases selected in jaw; the clinical experience and the evidences suggest the small diameter implants diameter 2 mm with finer threads in a denser bone as known in physiology in anterior mandible, to reduce the excessive insertion torque and potential pressure necrosis [19,20]. All of placements were carried out with a flapless approach. 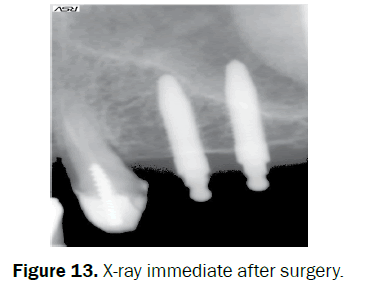 The SDIs were loaded as follows: 5 SDIs were immediate loaded while 43 SDIs were loaded after 3 months considering the initial critical stability period around to 3 weeks and the osseointegration period of 3 months as suggested in the initial guidelines . When the implants were loaded, the crowns and bridges were loaded with light contacts as with the conventional implants. Patient satisfaction was investigated after the surgical procedure through VAS (visual analogue scale) for post-operative pain after one hour and also again eight hours after surgery. During the revaluation, the VAS was used to assess the satisfaction of the patient relative to the treatment performed . The clinical evaluation was achieved from 18 to 50 months with 29 months being the mean evaluation period (Table 4). The period of 18 months represents the minimum follow-up suggested by the literature to evaluate the long-term restoration [22,23]. 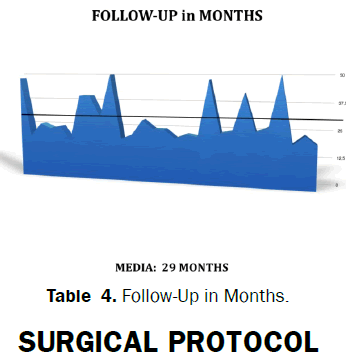 It is stated that in 28 patients selected: 5 patients (18%) have a follow-up from 18 to 20 months while 7 patients (25%) have a followup 40 months or over (4 patients indeed over than 4 years). Table 4: Follow-Up in Months. Just prior to the surgery, a rinse with 0.20% chlorhexidine was performed and then the tongue and the gums was cleansed around the surgical site with gauze soaked in 0.20% chlorhexidine; Mepivacaine with epinephrine 1:100,000 was the local anesthetic used. The surgical procedure was flapless with a "punch" technique in 95% of all of the cases and in only two cases the procedure was flapless with a "mini incision" technique. CASE 1: 40 years old Caucasian female, non-smoker, no meds at the time of the treatment. Figure 2: Initial clinical view. Figure 3: Initial clinical view: reduced residual ridge. Figure 4: Initial clinical view: reduced residual ridge. Figure 5: X-Ray immediate after surgery. Figure 6: X-Ray immediate after surgery with contrast. Figure 7: X-Ray immediate after surgery with contrast. 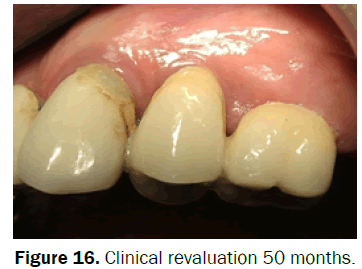 Figure 8: Clinical revaluation 18 months: complete gum remodeling around the restoration. Figure 9: X-Ray 18 months after prosthetic restoration. Figure 10: X-Ray 18 months after prosthetic restoration with contrast.. In many cases, a surgical guide was provided to simplify the parallelism of the implants. The surgical protocol for the insertion of the small diameter implants MDL™ (Intra-Lock International®;) requires a partial osteotomy with a single 1.2 mm drill for a third of the length of the implant. A full osteotomy is not necessary due to the self-tapping/self-drilling nature of SDI's. The loading of the implants were performed according to the guideline prescriptions. Immediate loading was applied only to those patients with high bone density and a high torque intersection (more than 35 Ncm) [24-26]. The average time of evaluation for the process of osseointegration was three months [13,14,27]. The average time for the insertion of the small diameter implant was calculated at around seven minutes with a considerable reduction of the surgical time even where the guidelines provided for a greater number of fixtures - two SDI's for a molar, for example [15,27]. The post-surgical treatment included 600 mg ibuprofen after the surgery and the application of ice was recommended for 3 hours after the surgery. The recommendation was then 400 mg ibuprofen twice every eight hours after the first dose and then afterwards as the patient needed. Antibiotic therapy was prescribed (amoxicillin and clavulanic acid three days after treatment every 12 hours) only in patients with an infectious risk. The post-surgical therapy included the use of 0.20% chlorhexidine twice daily for 10 days following the surgery. Post-surgical pain was evaluated by VAS (visual analogue scale) one hour after surgery and again eight hours after surgery. 35 teeth in total were restored: 25 teeth restored in the maxillary arch that is a suspected area to have more implant failure due to generally lower bone density with greater prevalence for premolars and molars; 10 teeth restored in the jaw (Tables 5 and 6). CASE 2: 66 years old Caucasian female, non-smoker, antiplatelet therapy during the surgical procedure not suspended. The results show no loss of bone around the small diameter implants during the period of the follow-up. The revaluation was conducted radiologically (Figures 11-17). CASE 3: 43 years old Caucasian male, smoker > 20/die, no meds at the time of the treatment. Figure 11: Initial clinical view. Figure 12: Intra surgery: flapless procedure no bleeding. Figure 13: Intra surgery: flapless procedure no bleeding. 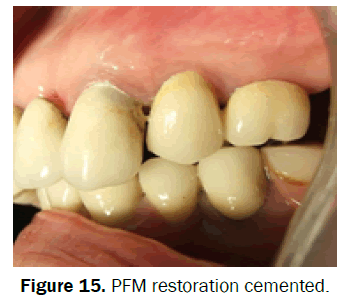 Figure 15: PFM restoration cemented. Figure 16: Clinical revaluation 50 months. Figure 17: X-ray revaluation 50 months. The perimplant soft tissues were trophic and well occlusive; the implant diameter and the one -body design with cemented abutment able to seal the perimplant area eliminating micro-leakages may play a key role in pink tissue outcomes (Figures 18-23). 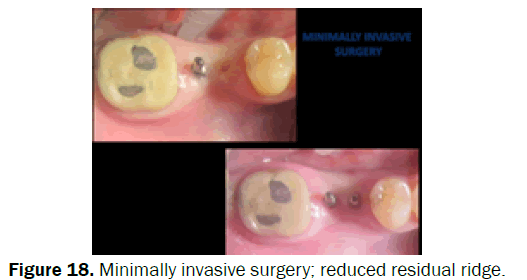 Figure 18: Minimally invasive surgery; reduced residual ridge. Figure 19: MDLTM(Intra-Lock International®, Boca Raton, FL, USA) impression transfers. Figure 20: Cemented abutments –metal free definitive composite crown. 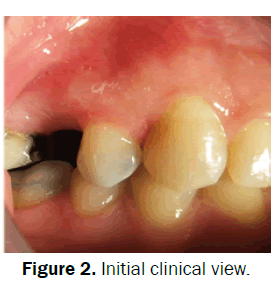 Figure 21: Clinical revaluation 20 months: complete gum remodeling around the restoration. Figure 22: X-ray immediate after surgery. Figure 23: X-ray revaluation (20 months). The patient's satisfaction registered was high in 97% of the cases: both in post-surgical phase that in revaluation. VAS values relative to the post-operative discomfort did not report values greater than six (scale 0-10) in the post-surgical period. VAS conducted during the re-evaluation indicates high patient satisfaction to the treatment received, with average value greater than 8 (scale 0-10). In attempts to reduce patient morbidity and convalescence, minimally invasive surgical techniques are becoming more and more discussed and practiced. Accurate planning and case evaluation are imperative for a success. The versatility of the SDI offers the opportunity to propose an implant treatment to patients of wider ranges. Failures in some cases have dissuaded some clinicians from using SDI's. Some of these failures may have resulted from loading them too soon in areas with soft bone, use of implants of inadequate lengths, and or patients' para-functional habits. With decreased surface areas of the SDI's, it is recommended to choose longest possible implants without causing harms to surrounding vital structures [8,12-14]. • Multiple SDIs can offer an adequate surface area needed for a successful fixed prosthetic. • Engagement of the cortical plates in thin ridges for excellent primary stabilization. • No micro-gap as the SDI's are one body design. OSSEAN surface is a characterized by its fractal topography that extends beyond the nano-scale level. Ossean is extremely hydrophilic surface and its impregnated with calcium phosphate molecules incorporated into the surface structure [28,29]. As reported in the scientific journal, Bone, a research team from New York University has confirmed: the fractal, nano-rough Ossean surface, developed for their dental implants actually changes the cellular genetic expression - or the fate of stem cells -at the nano-level, which in turn induces faster healing of implants . The small diameter implants MDL™ (Intra-Lock International®; Boca Raton, FL, USA) have Blossom™ threads; Blossom™ is a pending cutting design, it enables the implant to cut through bone with the efficiency of a knife minimizing bone compression and microfracture [31-33]. MDL™ (Intra-Lock International® Boca Raton, FL, USA) has a patented cemented abutment that fit over the O-ball head which gives more prosthetic options when needed and reduce the disadvantages feared from some clinicians. These peculiarities maybe have influenced, with others already mentioned factors, the results registered in the clinical experience both in early healing phase that during the revaluation period because it was not recorded negative bone remodeling during the follow-up. The clinical experience shows good performance of small diameter implants in fixed solutions; the results are appreciated from clinicians and from patients for the minimal invasive approach and functional standpoint. During the follow-up period we have not registered peri-implant bone resorption; we have noticed healthy gingival remodeling around the implants. The reduced diameter of the abutments helps to secure a favorable remodeling of the soft tissues; the abutment connection is able to seal the perimplant area eliminating micro-leakages. The results achieved in the clinical trial encourage the use of small diameter implants in some clinical situations as example thin bony ridges and or limited interdental spaces, not just in anterior areas as initially proposed from earlier literatures. Some of the important factors for a success are: a clinically considerate patient selection, a planning according to the guidelines, and emphasizing judicious checking on occlusion after restoration is completed. The author acknowledge the help of Sunook Hwang, D.D.S. USA, in the preparation of this manuscript. Dr. Sunook Hwang DDS doesn't share the same opinion on the section of the article about Ossean surface. Christensen GJ. The advantages of minimally invasive dentistry. J Am Dent Assoc 2005l;136:1563-1565. Lee DH, Choi BH, Jeong SM, Xuan F, Kim HR. 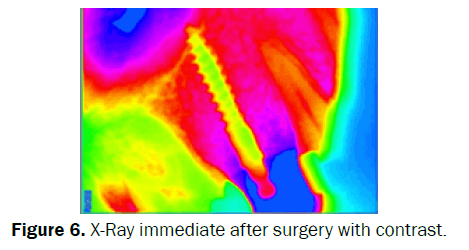 Effects of flapless implant surgery on soft tissue profiles: a prospective clinical study. Clin Implant Dent Relat Res.2011;13: 324-329. 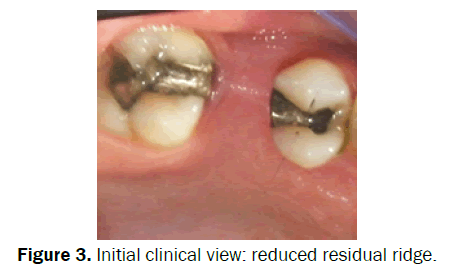 Brodala N. Flapless surgery and its effect on dental implant outcomes. Int J Oral Maxillofac Implants 24 Suppl. 2009;118-125. 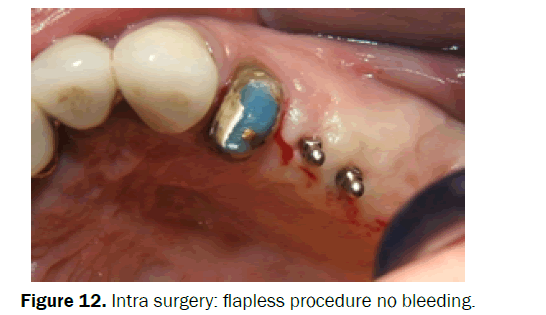 Romero-Ruiz MM, Mosquera-Perez R, Gutierrez-Perez JL, Torres-Lagares D. Flapless implant surgery: A review of the literature and 3 case reports. J Clin Exp Dent. 2015;1:146-52. Sclar AG. Guidelines for flapless surgery. J Oral Maxillofac Surg. 2007;65:20-32. Jeong SM, Choi BH, Xuan F, Kim HR. Flapless implant surgery using a mini-incision. Clin Implant Dent Relat Res.2012;14:74-79. Flanagan D. Flapless dental implant placement.J Oral Implantol.2007;33:75-83. Flanagan D. Fixed partial dentures and crowns supported by very small diameter dental implants in compromised sites. Implant Dent.2008;17:182-191. Mohan CS, Harinath P, Cholan PK, Kumar DL. Predictable aesthetic outcome with immediate placement and early loading of one piece mini implant - A 5 year follow-up case report. J Int Oral Health. 2014;6:132-135. Mazor Z, Lorean A, Mijiritsky E, Levin L. Replacement of a molar with 2 narrow diameter dental implants. Implant Dent.2012;21:36-38. Mascolo A, Patel PB. SPLINTED ZIRCONIA FIXED PARTIAL DENTURE SUPPORTED BY MINI IMPLANTS IN THE POSTERIOR MANDIBLE: A CASE REPORT. J Oral Implantol. 2012. Shatkin TE, Shatkin S, Oppenheimer BD, Oppenheimer AJ. Mini dental implants for long-term fixed and removable prosthetics: a retrospective analysis of 2514 implants placed over a five-year period. Compend Contin Educ Dent.2007;28:92-99. Shatkin TE, Petrotto CA. Mini dental implants: a retrospective analysis of 5640 implants placed over a 12-year period. Compend Contin Educ Dent.2012;33:2-9. Flanagan D, Mascolo A. The mini dental implant in fixed and removable prosthetics: a review. J Oral Implantol.2011;37:123-132. Estafanous, Emad W, Huynh-Ba, et al. THEMATIC ABSTRACT REVIEW: “Mini-Implants”: Do We Have Data?? International Journal of Oral & Maxillofacial Implants. 2011;26:932-934. Gleiznys A, Skirbutis G, Harb A, Barzdziukaite I, Grinyte I. New approach towards mini dental implants and small-diameter implants: an option for long-term prostheses. Stomatologija. 2012;14:39-45. Shemtov-Yona K, Rittel D, Levin L, Machtei EE. Effect of dental implant diameter on fatigue performance. Part I: mechanical behavior. Clin Implant Dent Relat Res. 2014;16: 172-177. Toyoshima Y, Wakabayashi N. Load limit of mini-implants with reduced abutment height based on fatigue fracture resistance: experimental and finite element study. Int J Oral Maxillofac Implants. 2015;30:10-6. Misch CE. Density of bone: effect on treatment plans, surgical approach, healing, and progressive boen loading. Int J Oral Implantol. 1990;6:23-31. Orlando B, Barone A, Giorno TM, Giacomelli L, Tonelli P, et al. Insertion torque in different bone models with different screw pitch: an in vitro study. Int J Oral Maxillofac Implants.2010;25:883-887. Hawker GA, Mian S, Kendzerska T, French M. Measures of adult pain: Visual Analog Scale for Pain (VAS Pain), Numeric Rating Scale for Pain (NRS Pain), McGill Pain Questionnaire (MPQ), Short-Form McGill Pain Questionnaire (SF-MPQ), Chronic Pain Grade Scale (CPGS), Short Form-36 Bodily Pain Scale (SF-36 BPS), and Measure of Intermittent and Constant Osteoarthritis Pain (ICOAP). Arthritis Care Res (Hoboken). 2011;63:240-252. Randow K, Ericsson I, Nilner K, Petersson A, Glantz PO. Immediate functional loading of Brånemark dental implants. An 18-month clinical follow-up study. Clin Oral Implants Res.1999;10:8-15. Vanden Bogaerde L, Pedretti G, Dellacasa P, Mozzati M, et al. Early function of splinted implants in maxillas and posterior mandibles, using Brånemark System Tiunite implants: an 18-month prospective clinical multicenter study. Clin Implant Dent Relat Res. 2004;6:121-129. Dilek O, Tezulas E, Dincel M. Required minimum primary stability and torque values for immediate loading of mini dental implants: an experimental study in nonviable bovine femoral bone. Oral Surg Oral Med Oral Pathol Oral Radiol Endod. 2008;105:20-27. Reddy MS, O'Neal SJ, Haigh S, Aponte-Wesson R, Geurs NC. Initial clinical efficacy of 3-mm implants immediately placed into function in conditions of limited spacing. Int J Oral Maxillofac Implants. 2008;23:281-228. Comfort MB, Chu FC, Chai J, Wat PY, Chow TW. 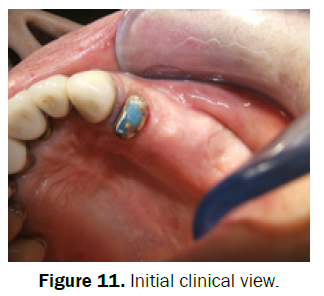 A 5-year prospective study on small diameter screw-shaped oral implants. J Oral Rehabil.2005;32:341-345. Bulard RA. Mini implants. Part I. A solution for loose dentures. J Okla Dent Assoc.2002;93:42-46. Jimbo R, Anchieta R, Baldassarri M, Granato R, Marin C, et al. Histomorphometry and bone mechanical property evolution around different implant systems at early healing stages: an experimental study in dogs. Implant Dent. 2013;22:596-603. David M, Dohan Ehrenfest, Marco Del Corso, Byung-Soo Kang, Philippe Leclercq, et al. Identification card and codification of the chemical and morphological characteristics of 62 dental implant surfaces. Part 1: description of the Implant Surface Identification Standard (ISIS) codification system. POSEIDO. 2014;2:7-22. Paulo G. Coelho, Tadahiro Takayama, Daniel Yoo, Ryo Jimbo, Sanjay Karunagaran, et al. Nanometer-scale features onmicrometer-scale surface texturing: A bone histological, gene expression, and nano mechanical stud Bone. 2014;65. Hirata R, Bonfante EA, Machado LS, Tovar N, Coelho PG. Mechanical evaluation of four narrow-diameter implant systems. Int J Prosthodont.2014;27:359-362. Freitas AC Jr, Bonfante EA, Giro G, Janal MN, Coelho PG. The effect of implant design on insertion torque and immediate micromotion. Clin Oral Implants Res.2012;23:113-118.